Applied at the first symptoms of pain, Peppermint Tension Essential Oil Blend has been effectively used to prevent headaches and migraines. Our proprietary blend of peppermint and essential oils work together to relax tension, clear confusion and reduce mental fatigue while assisting the body's ability to respond to stress. 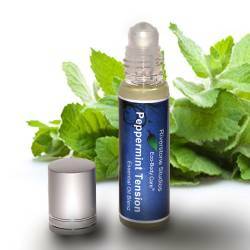 Peppermint Tension blend can also be used to soothe nausea and relax sore muscles.  Made fresh daily - just like your coffee! Available to order. * Relieves pain, tension, sore muscles, and inflammation. * Used for all types of headaches, migraines, neck, shoulder and back pain. * Used in aromatherapy for its calming, relaxing and balancing properties. * Helps overcome mental fatigue and improves mental clarity, concentration and focus. * Easy to use in a roll-on bottle. Migraine: Apply across forehead at first signs of a headache. Rest. Repeat as needed. Muscle/Nerve/Pain: Apply directly on affected area along with Healing Salve for deep effective pain relief. Mental Alertness: Rub behind ears or on wrists. Children (4-12yrs): Test small area for sensitivity before use. If too strong, dilute application area with Virgin Coconut Oil or Virgin Olive Oil before application. Caution: Avoid using on person with high blood pressure. * Store in a cool, dark location with the lid secured. The information on this page has not been evaluated by the Food and Drug Administration. This information is not intended to diagnose, treat, cure or prevent disease. Any and all claims of healing properties are based on widely accepted scientific research done on the properties of the individual ingredients. 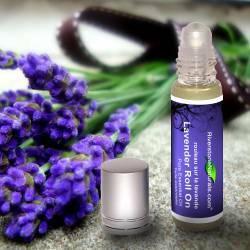 Neither Health Canada nor Riverstone Studios / Riverstone Naturals endurses the practice of ingesting essential oils. Alwyas consult a physician regarding health conditions.